My brother sent me a link to these great YouTube videos today. These were designed by nfl.com to get people to play their fantasy football game. Enjoy! Tim Keller has quickly become one of my favorite authors and thinkers. This is a fantastic interview. Enjoy. This is really good. Check it out. Tomorrow morning I’ll be preaching on one of the most beautiful passages in Scripture. It’s the story of Jesus’ healing of the blind man outside of Herod’s Temple. I hope you’ll join us for a very powerful Sunday as we take a look at the significance of Jesus’ miracle and how it applies to our lives today. Services at Woodbury Community Church take place at 9:00 and 10:30 AM. 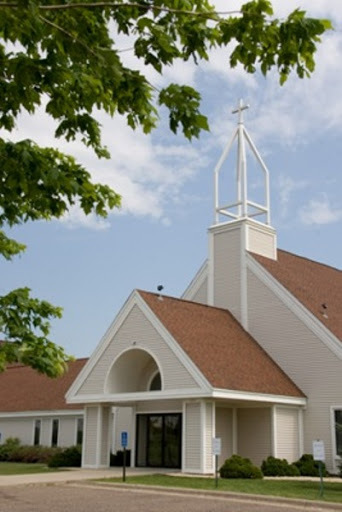 Woodbury Community Church is located at 2975 Pioneer Drive, Woodbury, MN 55125. On Sunday, I didn’t quite make it through my entire sermon. I told my congregation that one of the great things about being a pastor is the opportunity that I have to study the Word of God each week. I’ll spend hours in preparation, often times reading 200+ pages in preparation for a message. That was the case last week. So, what you have below is the sermon that I had intended to preach Sunday. I preached everything but the final illustration. May this be a blessing to you! I wonder, this morning, what’s the best vacation that you’ve ever taken in your life? Is there a place that you and your family retreat to every year? Maybe you are a typical Minnesota/Western Wisconsin person, and there is nothing like a week at the cabin. Maybe it was your honeymoon. I know there are many in our congregation who like to escape the cold of a Minnesota winter and head somewhere warm like Florida or Arizona or Mexico. Are you a cruise person? I think after the cold week that we’ve had this week, most of us could easily be persuaded to become cruise people. No matter what type of vacationer you are, I bet that when it’s all over, or when the holidays end, or when the visit with relatives comes to pass, there is a bittersweet longing for more. There is a natural excitement that comes with days off of work, time with close friends and family, fun games being played and memories being made. It is true of us, and it was true of those who lived before us. When we left John seven, last week, Jesus was at the Feast of Tabernacles. It was a glorious festival, a holiday, celebrated by the nation of Israel. I told you last week, and the Wessman’s told you in October, (when we joined our Jewish friends in celebrating the Feast) that this Feast was considered to be the most joyful celebration of the year. The harvest had come, God had provided, and the people remembered the faithful hand of God in caring for them during the wilderness wanderings. They slept in makeshift shelters, with very specific instruction that at least part of the roof was left open so that they could see the stars and reflect upon God. There is something special about camping. Some of you are expert campers. I am not. My first retreat as a youth pastor was a horseback riding and hiking trip. I had taken the place of a youth pastor who had majored in forestry at the University of West Virginia. He had left church youth ministry to become a camp director. I had never been backpacking before in my life. I had no idea what I was doing. After three days of riding horseback, my body ached. After backpacking another forty miles in three days, I thought I was going to die. I complained a lot on that trip. But, looking back upon it, it was one of the greatest trips of my life. As we pitched our tents each night, we saw stars in the mountains of Pennsylvania that we couldn’t see in Washington D. C. And, the communal experience of sharing life together in tents was precious. There were no electronics allowed on the trip. Our entertainment was the stories that we told to each other. The bond between those who went on that trip was special. And, we were all sad to leave. That’s how it must have felt to the Children of Israel as the Feat of Tabernacles came to an end. Every year, the Feast made the population of Jerusalem swell. And, every year, the pilgrims would head back home, leaving behind the shelters that they had made. 53Then each went to his own home. 1But Jesus went to the Mount of Olives. The Festival was over. Remember, all Jewish men who lived within twenty miles of Jerusalem were required by law to be at the Feast. It was time for them to go home. Jesus wasn’t through in Jerusalem though. He had much left to do. He had come to the Feast of Tabernacles late in the celebration, and there was a lesson that still needed to be taught. So, that night, he went up to the Mount of Olives, which is a ridge that runs north and south for about two miles, located just across from the Kidron Valley east of Jerusalem. Chances are that Jesus stayed in the shelter that He had constructed for himself during the Feast of Tabernacles. He’s probably not the only one that stayed in a shelter for the night. Many of the Jews may have wanted to celebrate one more night, after all, the Festival was a highlight of the year, and there are those who just don’t want vacation to end. 2At dawn he appeared again in the temple courts, where all the people gathered around him, and he sat down to teach them. The people were in for quite a day. They had arrived early at the temple courts. The sun was just rising. They could have been there for morning prayers, to give their offering to the temple before they went home, or to resume their daily ritual, now that the larger crowds from the feast were gone. When Jesus joined the crowds in the courts of Herod’s temple, he was surrounded. The day before, Jesus had raised the ire of the religious elite through his radical teaching. He had also found a new group of followers. Remember, we have no record of Jesus’ disciples being with him on the visit to Jerusalem. But, there were new disciples. There were new converts. At the end of my sermon last week I said that I could have titled last week’s sermon, Jesus – The Divider. Some believed, some rejected Him, some tried to kill him. The plot to assassinate Jesus was in full bloom. But, God kept thwarting the attempts of the Jews to murder Christ. He would not be put to death on this day either. Because Jesus was 100% God he knew that today would not be the day of his death. So, he taught openly. And, for the first time in John’s Gospel, Jesus sat down to teach. It was the traditional way a for a rabbi to teach. Often times, the people would ask the rabbi questions. He would respond to their questions with his teaching. We’re not sure what Jesus was teaching the crowd before the arrival of a small band of Pharisees and Scribes, but we do know what he taught afterwards. In the midst of his teaching a raucous display of hatred broke his train of thought. 3The teachers of the law and the Pharisees brought in a woman caught in adultery. They made her stand before the group 4and said to Jesus, “Teacher, this woman was caught in the act of adultery. 5In the Law Moses commanded us to stone such women. Now what do you say?” 6They were using this question as a trap, in order to have a basis for accusing him. It was quite a trap. Like many of the questions the Pharisees, and this time the scribes and the Pharisees, asked Jesus, this question was meant to turn the tide of public opinion against Jesus in such a great way, that the crowds would take care of killing Jesus for them. Here is the situation. Old Testament law required that a person caught in the act of adultery be killed. The religious leaders were becoming famous for twisting the law. The law did not state that all women accused of committing adultery were to be stoned. That was reserved for the woman who was betrothed to be married that was found to be in an adulterous affair with another man. The man, in that case, was to be put in a pile of donkey dung, up to his knees, and then he was to have a rough towel put around his neck. In between the rough towel and his neck was to be a smooth towel. Two men were then to pull on the opposite sides of the towel until the man died. This way, no mark would be left on his neck, and it was symbolic of the fact that God was the judge who was taking the man’s life. If a married woman was caught in adultery she was to be brought to her husband, and he would decide how she would die, by stoning or strangulation. Or, he could choose to forgive her. Adultery was one of the few sins punishable by death. And, the Jewish crowd that was listening to Jesus knew it. If Jesus told the men not to stone her, he would in essence be saying that the law of Moses, a law handed down from God, didn’t matter. He would be saying that he was greater than the law. Later on Jesus would refer to himself as the Lawgiver. So, would the apostle John and the apostle James. If Jesus said, “Go ahead. Stone her,” he would have lost his goodwill among the people. He had shown himself to be a compassionate and grace filled teacher. He taught as no one before him had taught. He would look like a heartless Pharisee. If he said to stone her, he would have also rebelled against the Roman authority, which had specifically said that only Roman authorities had the right to demand a life. Jewish leaders knew that they had no authority to legally execute someone in first century Palestine. Verse three is particularly telling of the hatred of these men. Remember the timing of this event. It happened just after the Feast of Tabernacles ended. The shelters were still up all over the city. It would not have been difficult to catch a couple that was engaged in an illicit affair inside one of those tents. It wasn’t as if this woman was in the home of someone, where four walls and locks prevented her from being found out. Some have speculated that the religious leaders bribed a man to seduce this woman during the Festival. In the vacation like atmosphere of the feast, the woman could have been more vulnerable to a seduction. After all, there is no mention of the man that she was engaged in the affair with. This may have been an elaborate setup planned by the Pharisees and Scribes. The Greek language carries with it the idea that the literally ripped the woman out of the arms of her lover. She was probably naked, or wearing only a sheet around her body as the Pharisees paraded her in front of the people .There was nothing that she or anyone else could do about it. These men were the most powerful men in the entire nation. Talk about shame! Talk about judgment! She had never felt so vulnerable in all of her life. She knew that she was about to die. Maybe she was thinking of her betrayed husband. Maybe she was thinking about her children, if there were any. Maybe she was thinking about the shame that she was bringing upon her parents or her family name. I wonder if she looked people in their eyes or hid her eyes in shame. I think it was the latter. I’m sure she just wanted it all to end, for the nightmare to be over. One commentary I read said that the Bible is a book of names. God is a God of names. We see him interact with real people. We read of God and Adam and Eve. We read of God and Abraham and God and Moses. There are entire chapters of the Bible dedicated to names. And, we don’t know this woman’s name. The Pharisees use her as a tool. They dehumanize her. They treat her like a piece of meat. She is being used. And, Jesus responds in such a tender way. 9At this, those who heard began to go away one at a time, the older ones first, until only Jesus was left, with the woman still standing there. What a strange thing to do! The Pharisees wanted an answer on what to do with the woman, and Jesus bent down to start writing something in the ground. The Bible does not tell us what Jesus wrote, and there has been wild speculation about just what it is that he wrote for generations. There are some who believe that Jesus was writing down the charges that the Pharisees and Scribes made against the woman. Others say that Jesus was writing down the Ten Commandments. Some more liberal scholars say that the Pharisees caught Jesus. He was caught off guard and didn’t know what to do, so he started writing in the dust to buy time to formulate an answer. I don’t think so. Remember, last week, we said that Jesus was in complete command of everything that he did, right down to the timing of when he went to the feast and when he said what the things that he said. No, Jesus’ writing on the ground was purposeful. For some reason, even as Jesus wrote on the ground, the men demanded an answer from Him. Again, look at verse seven. 7When they kept on questioning him, he straightened up and said to them, “If any one of you is without sin, let him be the first to throw a stone at her.” 8Again he stooped down and wrote on the ground. Jesus answered their question in a brilliant way. He also gave them time to think about their response as he bent back down to write on the ground. I believe that Jesus was either writing the Ten Commandments or the sins of the men. In either case, the men were guilty of what it was that Jesus was writing on the ground. Notice what happened next. It was the older men who had lived the most life. They knew that they were guilty. And, the older men dropped their stones, as the finger of God once again wrote the law of God on earth. One by one the men dropped their stones and the woman stood there amongst the crowd that was listening to Jesus preach, and God in the flesh, Jesus Christ. 11″No one, sir,” she said. What a beautiful picture of our merciful Savior! Vulnerable, shamed, naked, shaking and scared, the woman was standing; and Jesus? Jesus was on his knees. Jesus was being a servant. Jesus was saving a life. Jesus was teaching. The son of man did not come to be served but to serve and to give his life as a ransom for many, including that woman. Did Jesus not care that the woman had committed adultery? No. He cared. He did not condone adultery then, and he does not condone adultery now. Jesus didn’t condone sin, but he accepted her. He loved the one that the Pharisees sought only to use as a pawn in chess match against Jesus. I believe that the woman had a change of heart right then. If she had not, she could not go and leave her life of sin. Only a person who has been redeemed can do so. It’s another example of Jesus being in control of the situation and the words that he used. As the Feast of Tabernacles came to a close, Jesus taught an important lesson about Himself. It was one more indication that He was God. Throughout the Old Testament, God was referred to light. Have you ever been in a dark place? Being afraid of the dark is a memory that many of us have from our childhood. I can’t even tell you the number of times that Cyndi and I have been awoken by one of our four children because of a fear of the dark. Like most parents, over the years we have tried to assure our kids that everything is alright, they are safe and there is nothing to be afraid of. We normally pray with our kids and then put a nightlight on to help them overcome the fear. When she left, I went to Wooddale’s alarm panel to arm the building. I was told that it would be a simple process. I just needed to type in code on the panel and the building with lock down. I had thirty seconds to get out of the building after typing in the code. If I didn’t do so, the alarm would go off and the police would be on their way. Simple enough! So, all alone in the huge building that I had worked at for a month, I entered the security code. That’s when a strange code showed itself on the screen. It said “Door Ajar S Shop.” The building could not be shut down until that door was closed. There was just one problem. I had no idea what the S-Shop was. All I could think that S-Shop could mean was Sweet Shop, because we had a place called the Sweet Shop at the place that I vacationed growing up. But, there is no sweet shop at Wooddale Church. The security code that I had typed in had turned off all of the lights in the building. It was dark! I had no idea where to find a flashlight, so I began the long process of trying to find the S-Shop at Wooddale Church. I couldn’t find it. I had no idea where the door was. When I walked down the stairs at Wooddale and entered the lower level, every scary movie that I had seen as a teenager re-entered my mind. I was sure there was some kind of drifter in the building. I just knew that the person was going to jump out from behind some dark crevice and take my life. I have never wanted light so bad in my entire life. It took my about two hours to find the door. At 2:15 AM I finally left Wooddale Church after finding the door in a janitor’s closet. When Jesus talked about being light, He was talking about something much more significant than the candelabras that lit up Jerusalem during the Feast of Tabernacles or the lights that show us around our homes and businesses. Jesus is the Light that shows the world God. We can’t see God apart from Christ. And, in Him we have seen God. In verses 13-20, Jesus shows us that He is the Light of the World by revealing Himself. “You do not know me or my Father,” Jesus replied. “If you knew me, you would know my Father also.” 20He spoke these words while teaching in the temple area near the place where the offerings were put. Yet no one seized him, because his time had not yet come. There they go again. The Pharisees are trying to trap Jesus. They are trying to trap the Lawgiver by the law. Jesus shows them that they are not worthy to judge. Only God can judge. Because He is God, Jesus has the authority to act as His own witness because He has been sent by the Father. His message proved that. His actions proved that. Jesus life testified to the fact that he was the Light of the World. In verses 21-27 the Light of the World revealed the Father. 25″Who are you?” they asked. 27They did not understand that he was telling them about his Father. It’s so sad that the Jewish leader’s hearts were so hardened that they could not understand what Jesus was saying. He was basically telling the religious leaders that all of the religiosity would not bring them eternal life. They could not fathom that they would spend eternity apart from God, but Jesus tried to tell them just that. They would not go to the Father unless they followed the Light of the World to Him. They needed Jesus in order to have eternal life. When Jesus told them, “Where I go, you cannot come,” he was telling them that unless they turned from their wicked ways, they would not experience eternal life with God. 28So Jesus said, “When you have lifted up the Son of Man, then you will know that I am the one I claim to be and that I do nothing on my own but speak just what the Father has taught me. 29The one who sent me is with me; he has not left me alone, for I always do what pleases him.” 30Even as he spoke, many put their faith in him. It’s a beautiful thing when someone does what verse 30 speaks about. Even as he spoke, many put their faith in him. And, why wouldn’t they. What Jesus offered those gathered in the temple treasury that day is so much better than the stale religion of the Pharisees. He offered life. It was the Light of the World that illuminated the hypocrisy of the Pharisees and the Scribes that day. As they brought a wicked woman before Christ, their own wickedness was shown to them and to the crowd. It wasn’t a large group of religious leaders that brought the woman to Christ. I wonder if some of them recognized their own hypocrisy on that day. I wonder if some of them had their lives transformed for good. It was the Light of the World that showed the true heart of God to the woman caught in adultery. He is the God who loves the sinner and hates the sin. He is the God who forgives. He is the God who cares about the individual and wants to see lives made whole. He is the God who knows your name, who knows everything about you, and has shown you Him. He wants you to see the Light. He wants to show you the way to the Father. He wants you to remember the cross. Finally, He is the Light of the World who has called you to be the light of the world. To his most committed followers in Matthew 5:14-16, Jesus said, 14″You are the light of the world. A city on a hill cannot be hidden. 15Neither do people light a lamp and put it under a bowl. Instead they put it on its stand, and it gives light to everyone in the house. 16In the same way, let your light shine before men, that they may see your good deeds and praise your Father in heaven. This summer I told you about a book that was published last year by the Fermi Project. The Fermi Project was a giant research initiative to test the spiritual climate of Americans, especially those between the ages of 16-29. The study took three years, and involved over 60,000 participants. It was done in conjunction with the Barna Group. The findings of that study are now available in the book unchristian by David Kinnamon and Gabe Lyons. One of the first questions that the study asked was, “Do you know any Christians?” The vast majority did. In fact, many of the people, considered outsiders to Christianity, had at one time called themselves Christians. Most had spent at least a couple of months involved with some type of church. 57% of the respondents said that they knew at least one evangelical Christian. 86% said that they knew a born again Christian. Only 16% of the respondents had a good impression of Christianity. When the words “born-again” were put in front of the word “Christianity” that number dipped to 10%. When the word “Evangelical” was put in front of the word Christianity, the number dipped once again; this time to 3%. How can it be? How have we come to the point where only 16% of unchurched Americans, between the ages of 16-29, have a favorable impression of Christianity? The polling showed that Christianity has a serious image problem. When asked further questions to help the researchers understand the attitude of those outside the church towards those that they considered Christians the survey found the following beliefs about Christians to be the major contributing factors for the negative view of Christianity. • 91% of those surveyed said that Christians were antihomosexual. Friends, if we were more like Jesus, we’d mess those statistics up. Let’s not be like the religious elite that we see in the book of John. May we be the light of the world, pointing people to the Light of the World! The only way that can happen is when we know the Light of the World. Last week, a former professor of mine, Ed Dobson, was featured on Good Morning America and USA Today. He left the world of academia to become a pastor several years back. Then he was struck with ALS, the crippling disease that will eventually take his life. He left his pastorate when the ALS began to effect his body, but he is still being used by God in a mighty way. Listen to some excerpts from the USA Today article, “The Rev. Ed Dobson has spent most of his life following Jesus. But only now does he realize how hard it is to live like him. The retired megachurch pastor and one-time architect of the religious right has spent the last year trying to eat, pray, talk and even vote as Jesus would. His revelation: Being Jesus is tough. . . .During recent Christmas celebrations, as Christians worshipped the Christ child born in a manger, Dobson appreciated more than ever the man who preached love, only to die on a cross. Dobson has known suffering. He was diagnosed in 2001 with ALS, better known as Lou Gehrig’s disease. Neither its deteriorating effects nor his work as a vice president at a local Christian university deterred his determination to emulate Jesus. Cornerstone University President Joseph Stowell, who hired Dobson as vice president for spiritual formation last spring, said he admires Dobson’s commitment, but is not surprised by it. It reflects his longtime friend’s desire to “live outside the box” despite his health challenges. Dobson never knew how demanding that walk could be until he resolved to take it — and found it took him in unexpected directions. He decided to devote a year to living like Jesus after reading “The Year of Living Biblically,” A.J. Jacobs’ best-selling account of obeying Bible commands as literally as possible. If a non-religious Jew could do it, Dobson decided, so could a practicing Christian. That meant following Old Testament laws about eating, clothing and behavior, since Jesus was a Jew whose followers created Christianity. Observing kosher dietary requirements to not mix meat and dairy products, Dobson gave up his beloved chicken-and-cheese burritos. “I can’t wait to order it for the first time” in the new year, he said with a chuckle. . . .Obeying the biblical command not to trim beards, he let his grow as long and shaggy as an Orthodox rabbi’s. “It’s a pain in the neck when you’re eating spaghetti,” he cracked. But a messy beard was the easy part of living like Jesus. The man who preached for 18 years at Calvary Church re-read the four Gospels every week. He took to heart Jesus’ commands to help the poor and visit the imprisoned. He also heeded his warning that only those who do God’s work will enter heaven. “Jesus is a very troubling individual,” Dobson said.
. . . living the Jesus life was more personal than political. He prayed daily, repeatedly reciting “Jesus, son of David, have mercy on me” — the plea of a blind man Jesus healed. He doesn’t pray to be healed of ALS but relies on God’s goodness to help him through the slowly debilitating disease. His frame grows thinner and his hands weaker by the day. Focusing on Jesus helps. Ed Dobson is changed after a year of trying to live like Jesus. We don’t need to observe the kosher laws of the Jew and grow long beards to see God do something tremendous in us this year. We do need to learn more about Him and try to be more like Him. May you remember today’s big idea: God has called us to be the light of the world. May we be the light of the world, pointing people to the Light of the World! Financial struggles and uncertain economic times give us an opportunity to rely on Christ like never before. These days help us to remember who God is and who God isn’t. May we crave Christ like never before. Enjoy! 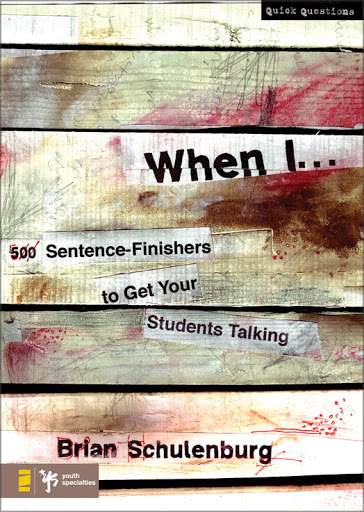 It’s a great book to use in classrooms, with youth groups, small groups, or around your family dinner table. You can order copies of the book by going here. Perfect for ice-breakers, road trips, small group discussions, or just about any other ministry setting, this is a useful resource for anyone in youth ministry, whether paid or volunteer, rookie or veteran. When I… will open up opportunities for discussions and conversations that will draw students and leaders closer together and will lead to new insights into what’s happening in the hearts and minds of students.